LONDON, England, UK- They left the Virgin Islands on Monday May 14, 2018 to fight the ‘mother country’, the United Kingdom, over its House of Commons Bill passed on May 1, 2018 to make public beneficial ownership of offshore accounts. The amendment was tied to a larger UK Sanctions and Anti Money Laundering Bill. If the Bill is enacted, it will bring an end to the Virgin Islands' Financial Services sector that accounts for some 60% directly and 80% indirectly of Government revenue and other economic gains. That means thousands of residents could be out of jobs, homeless and living in poverty. 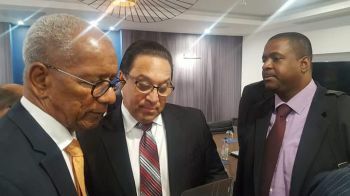 In reaction to the UK’s decision, both Premier and Minister of Finance Dr The Honourable D. Orlando Smith (AL) and Opposition Leader Hon Andrew A. Fahie (R1) have put aside local political differences and have gone to lobby the UK via a series of meetings. They are also joined by leaders from many of the other Caribbean Overseas Territories affected by the decision. Your statement is so ignorant. No wonder you only have one eye. We shouldn't expect better. Damn one eye, LOL, you got clap back on big time for talking S*\t. He may not look it but he is paying attention. Fahie was the best person to accompany Doc. I have a feeling this meeting is going to go well. Premier looks wide awake. Bring home the good news guys. This is the right first step to take. Fight for our rights to help move the BVI forward.We cannot do it alone all hands on deck. UK Parliament wants to change the BVI financial rules to fit themselves, and to put the BVI financial centers where they want to fit themselves. Question the UK government: Ask Dame Margaret Eve Hodge, Lady Hodge DBE MP why she wants to have the bill passed? Her background is Jewish and one of her concerns is Russian money being washed in the UK and overseas territories. Andres continue to do your utmost best service to the people of the BVI. The BVI Finanxial Services is only as strong as it has been due to the close relationship with the Square Mike (UK Financial Sevices). Many have exposed that the BVI does NOT hold liquidity (cash) from criminals and others whom use the BVI corporate vehicles to hide behind shell companies and such. Take for e.g. the Trump Ocean Club in Panama. That project used BVI corporate vehicles so foreign nationals (Russia) could buy units within the development and hide their true ownerships. Why did they want to be hidden; because they are such good upstanding citizens inherently- not! Whether it was the Panama or Paradise Papers that lifted the veil off of the decaades of using the BVI as a means to hide its now all over. MosFon was way too cushy with the Government and regulators here and thus they could execute these nefarious deals using BVI. How do we repair our tarnished global reputation? Maybe the march should be about that as opposed to the flagrant racial language being bandied about for personal salivation reasons. Hey people, I would bet that the reason the Premier is in the UK is to attend the royal wedding, which will most likely the same reason why the Governor will be in UK. I'm glad the opportunity is being taken to try to deal with this at the same time. but with the overall attitude of hatred towards freedom and human rights that the uk and us have - god knows. uk has nasty habit of doing whatever the usa says, like england isn't even its own country, with all its flaws. feds allowed in bvi, bullying of foreign territories - nothing has changed since two thousand years ago.